Based in London, Richard Roberts is an artist/self-publisher who specialises in print. 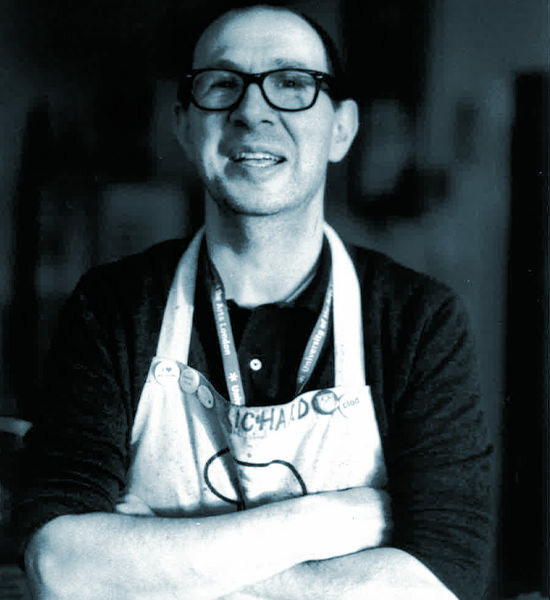 When he isn't making books or messing about in his studio, Richard works part-time at the London College of Communication as a printmaking technician. He’s also a member of Thames-Side Print Studio and runs a small studio of his own. Practice Makes Printmakers is a small studio in Hackney. It offers studio space for book artists/designers/illustrators with an interest in printmaking. It houses a well-maintained Kippax screenprinting table (up to A1 print size) a small etching press, suitable for drypoint, etching, embossing etc (up to A4+ print size), a relief press (up to A3+ print size) for lino/woodcuts and a galley press for letterpress. Clean and tidy, with lots of natural light, the studio has central heating and WiFi. There's also storage for prints and artists tools/materials and a communal table area for drawing, making etc. If you are someone who is in regular work but wanting access to printing/studio facilities in their spare time, please contact Richard for more information. If you're interested in buying a more expensive print but want to view first then please get in contact to arrange a studio visit. There is no obligation to buy. The address is Studio 303, Deborah House, Retreat Place, London, E9 6RG. Based on his own practice, Richard runs a 1 to 1 workshop that explores the 4 colour separation screen-printing technique. Participants learn all the skills to produce a 4 colour separation screen-print from one of their own photographs. This workshop is suitable for those with previous screen-printing experience beyond beginner level. He also runs bespoke workshops tailored to practitioners looking to further their skills generally. Please contact him for more details.